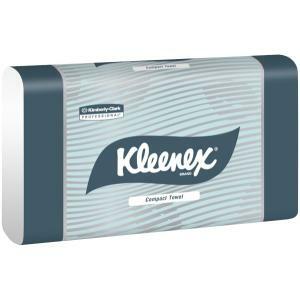 Kleenex Compact Hand Towel delivers premium quality with superior softness, strength and absorbency. Ideal for tight spaces and can be topped up for lower maintenance and reduced risk of run outs. KLEENEX compact hand towel delivers premium quality with superior softness, strength and absorbency. The compact, easy-to-load dispensers are ideal for tight spaces and can be topped up for lower maintenance and reduced risk of run outs.Single sheet dispensing helps reduce waste and overuse and the towel used is touched for maximum hygiene.